On the 24th June last I got some devastating news. A dear friend of mine died suddenly while he was on his holidays in Lanzerote. I’ve been wondering about how to blog about this for ages. I wanted to be able to give you all a feeling of what this man was like and how much he meant to me. But words fail me. I don’t have the eloquence to convey his brilliance. He was a shining light snuffed out too soon and I’m still foundering in the dark. Once I realised that I’m never going to be able to give an adequate impression of him or what his loss has meant for me I realised I just have to blog-on regardless. Why Oh Why am I back? “It is accomplished” – an FO! It would have to be a biggie that would get me back to my blog again after such a hiatus, wouldn’t it? Yoouuu betcha! “It is accomplished” – an Achievement! 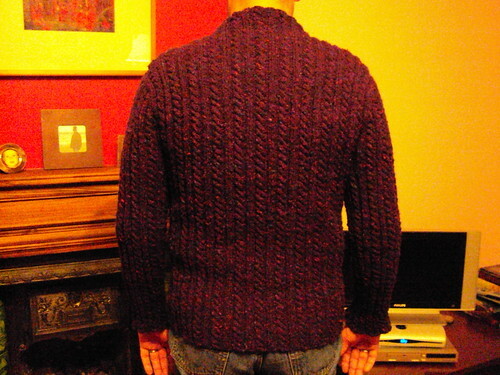 The completion of this cardigan signifies the huge journey that I have made in my knitting knowledge and ability. A journey that started over three years ago. As I came close towards the end of all the knitting I learned about spit-splicing from Lisa in TIK – very effective in the 100% wool Kilcarra I was using. When I had all the pieces ready for sewing, I discovered, through the power of d’Interneh (Knitty’s coffeeshop mainly) a concept I had never come across before: blocking. I did this fastidiously, measuring out all the pieces according to the schematic and waited days for them to dry. When it came to sewing-up all the pieces, I researched widely, bought “Knitting for Dummies” and became adept at invisible seams. I was very impressed with all my attention to detail: you couldn’t tell where the seams were and the sleeve caps melded beautifully in to the armholes. Then when it came to the zip I bought “Domiknitrix – whip your knitting into shape” by Jennifer Stafford and followed her instructions to the letter. Steam it? Check. Pin it? Check. Fit it on again as a double-check? Ah… disaster. 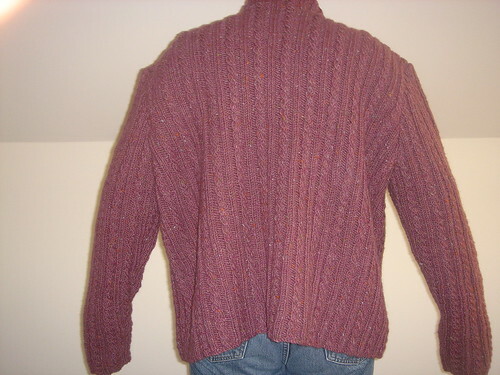 I learned the harsh reality that many a knitter learns only the hard-way: pieces knit to the correct dimensions does not guarantee a well-fitting garment. Later I learned why it is that so many patterns are written in pieces rather than maximizing the benefit of construction through knitting: editors of ladies magazines, where patterns were published, had more understanding of sewing-based construction for garments. Hence all the pieces were knit into the fabric shapes rather than the knit stitches being manipulated to mould the fabric. Enter: Elizabeth Zimmermann and Barbara G Walker into my life and my knitting. Enter: radical new ideas such as knitting-from-the-top, calculating gauge, charting my own design, customizing my knit to fit. Oh! and with a few short-rows thrown-in – always with the short-rows! This project has tested me at every turn. I have documented before how much more it and my knitting conspired to teach me – whether I wanted to learn or not. 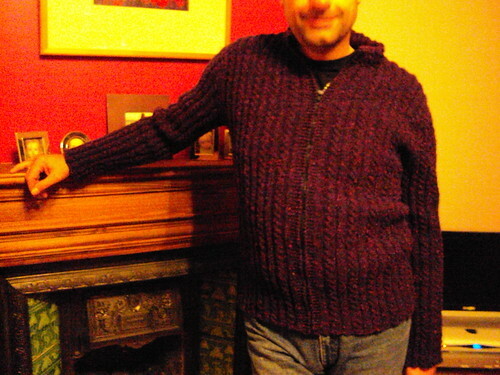 Even at the very end, when all the knitting was done and all that was left was the zip, I was very nearly thwarted: the original zips went AWOL and a special trip into Dublin City Centre was made to buy a long-enough zip. And I’m still learning. Even now, as DH is giving the cardigan its first outing in public tomorrow, I’m still thinking I might re-do the cast-off on the cuffs because I’ve just learned Jeny’s Surprisingly Stretchy Cast-off (JSSBO) from my latest Cat Bordhi book. However, Bootie (the Ever-wise) pointed out the more likely explanation is that – after three years – I’m not yet ready “to break-up with the cardigan”. I did it MYYYYYYY Waaaaaaay!